In our businesses, we often feel so out of control. We may be spending so much time putting out fires, we forget to take time to think about how God is blessing us. During this interview with one of our members, Renee, who is an infertility nurse, she and Tasha talk about gratitude and trusting in God’s plan. These are just some highlights of the interview. If you would rather listen to the interview, you can click here. If you would like to watch the interview, the video is linked at the end of this post. One of the first things that Renee says in the interview the quote above that she may be a little bit crazy, but God loves us for who we are, which is a great reminder for us as we run our businesses, or for everyone. 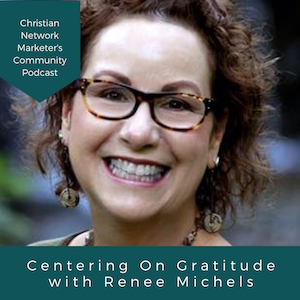 Renee early on in the interview says that one of the things she has been working on is to center on gratitude. Along that idea Tasha has a reminder that we need to trust and thank God for how He has made us, instead of comparing ourselves to others. One thing that Renee prays for along with gratitude is asking God, “Who are you going to put in my path today?” As a nurse, Renee works with so many different people, and she encourages us to “Be who we are and bring it out. Run with it and don’t be afraid.” That is such a great encouragement for all of us as people and as business owners. A last encouragement that Renee gives is to remind us that “It is not about me or you, it is about God.” We just need to trust in Him, listen to His word, and obey. And you’ll want to check out the recording and catch Renee’s final thoughts. Thank you for reading this post. If you want to see more about what the Christian Network Marketer’s Community is all about, please go to our Facebook page.